It’s hard to know how to present the discussion that took place this weekend on Fox News. During their recurring segment on Political Insiders, Fox contributor Pat Caddell floated his theory that it is Republicans who are responsible for the alleged targeting of Tea Party groups by the IRS (video below). Caddell: The establishment Republicans want the IRS to go after the Tea Party. Got it? They want to go after the Tea Party. Because the Tea Parties are an outside threat to their power hold. And, I’m telling you, the lobbying, consulting class of the Republican party, the Republican leadership, who have been attacking the Tea Parties and alienating them, they want the IRS doing this. If that’s true, then Caddell has uncovered a clandestine plot by the GOP to sabotage their strongest conservative allies and most reliable Republican activists and voters. 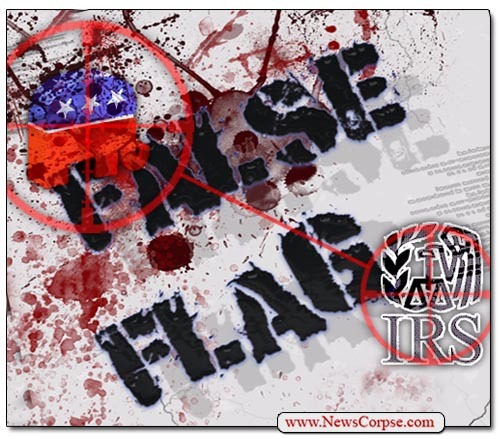 Did the Republicans infiltrate the IRS and orchestrate a strategy to deny Tea Partiers tax-exempt status? Did they conduct sham hearings in the House, led by the crusading committee chair (and recidivist criminal) Darrel Issa, all the while maneuvering secretly to oppress Tea Party organizations and cast the blame on Democrats? It’s not unlike a scenario I mockingly offered last year that accused the GOP of a False Flag Operation. It’s kind of a brilliant plan that would stifle intra-party rivals while putting Democratic foes in a negative light. And there are elements of the story that could be corroboration for such a plot. For instance, it turns out that the IRS Commissioner Douglas Shulman, and Lois Lerner, the head of the agency’s Tax-Exempt Organizations division, were Republicans hired by George W. Bush. So it never made sense that they would be engaged in a conspiracy to help Democrats silence the Tea Party. On the other hand, Caddell could be in the throes of severe dementia resulting in his imagining a wild conspiracy wherein the GOP is just another enemy of the patriots waving tea bags around. If his musings hold weight, should we expect Issa to convene new hearings indicting Republicans for their complicity in the alleged scandal? For that matter, can we expect apologies from Issa, and dozens of other Republican politicians and pundits, who falsely accused the Democrats of conspiring against the Tea Party? So which is it? Is Caddell breaking news or smoking crack? It’s often hard to tell with many of the ludicrous theories that waft from the halls of Fox News. It’s always been interesting to see the split in the GOP develop. The old guard supplies the huge infusion of corporate cash while the tea party supplies the primary base energy. The problem is that they are not even remotely natural allies and have completely different goals. A hatred of liberals and a black president are the only tie that binds. Is this one of Alex Jones’ “false flag” operations? I’m getting lost in the sheer stupidity of Teapublican rhetoric.